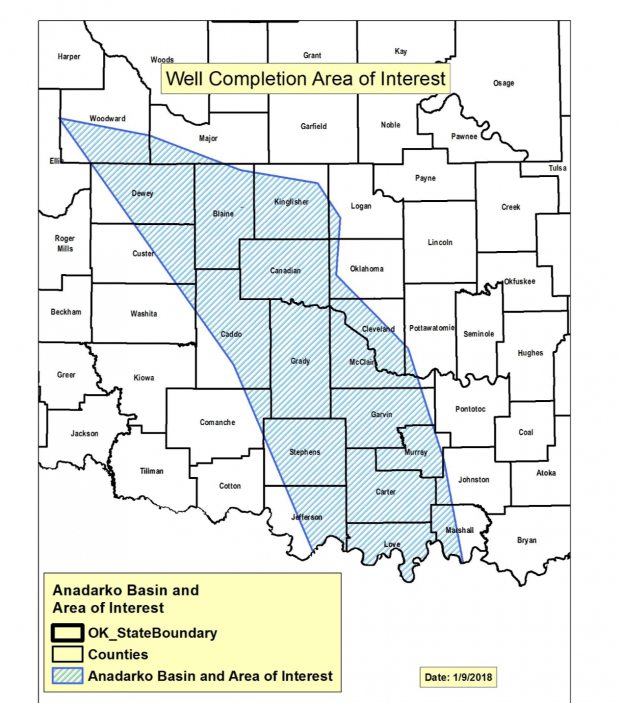 Updated guidelines from the Corporation Commission affect companies fracking wells in western Oklahoma oil fields. The stronger shaking caused by wastewater disposal wells appears to be declining. But seismologists have noticed an uptick in smaller quakes likely triggered by fracking in western Oklahoma’s SCOOP and STACK oil fields, where almost all new drilling activity is concentrated. Data suggest fracking-linked shaking can be reduced if companies act quickly and pause their operation before small quakes set off bigger ones. The new rules expand guidelines released in December 2016, when state regulators first moved to address earthquakes set off by fracking in addition to ones triggered by pumping oil-field waste fluid into underground disposal wells — a practice scientists have linked to most of Oklahoma’s strongest quakes. Under the updated guidelines, which the Oklahoma Oil and Gas Association says its member support, companies must have access to seismic sensors that generate real-time quake data. The Corporation Commission also lowered the threshold at which companies are required to start slowing fracking, and will ask some companies to pause fracking for at least 6 hours if a 2.5-magnitude or stronger occurs.